Phillip Stanfield | Jones, Skelton & Hochuli, P.L.C. An accomplished trial attorney, Phil Stanfield focuses his practice on transportation defense, professional liability, product liability, and defending insured’s covered by general liability policies. Phil is a member of the firm’s Rapid Response Team. Prior to pursuing a law degree, Phil worked as a chemical engineer for four years. In 2009, Phil was inducted as a Fellow by the American College of Trial Lawyers, an organization widely considered to be the premier professional trial organization in America. He is also a member of the American Board of Trial Advocates, an organization that selects is members based on trial skills and ethics and is dedicated to the preservation and protection of the right to jury trial. 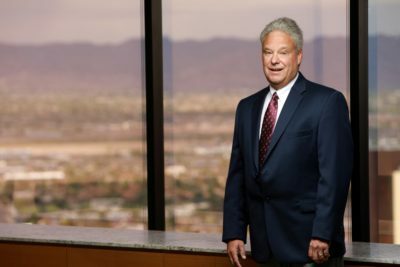 Obtained judgement in favor of defense, an Arizona-based professional liability corporation, when Plaintiff filed for a new trial but failed to meet his burden of proof to show prejudicial error under any of Rule 59’s exclusive grounds for a new trial. In the original case, the jury reached a verdict that apportioned zero fault for our client, a company who provided private security for a Kingman-area bar. Represented a motor carrier against allegations of wrongful death in a 6-day jury trial. The Plaintiff, wife of the Decedent, brought a wrongful death suit against our client, alleging that the Defendant, a truck driver for the motor carrier, failed to used reasonable force in repelling Decedent’s attack. Decedent, who had a .17 blood alcohol level, pursued the Defendant 26 miles down Beeline Highway. Upon catching Defendant, the Decedent attacked the Defendant, who then shot Defendant. The Defense argued comparative fault of Decedent. After two hours of deliberation, the jury found the Decedent to be 98% at fault and the Defendant to be 2% at fault. Obtained unanimous jury verdict in favor of client, a petroleum transportation provider, in 7-day trial. The Plaintiff, a 22-year old male truck driver, was a passenger in a pickup truck operated by his mother traveling on I-40 west of Winslow. Prior to the accident, the Defendant, who was operating an 18-wheel tractor-trailer, “cut-off” Plaintiff’s vehicle, as the freeway narrowed for construction. Plaintiff’s mother “let the truck driver have it” over the CB radio. After passing the construction zone, the Defendant moved into the fast lane of travel in an attempt to pass a slow moving RV. At the same time, as Plaintiff’s mother attempted to pass the slower moving tractor trailer, Plaintiff alleged that the Defendant sped up and collided with the rear of the Plaintiff’s vehicle. The impact caused the mother to lose control of the vehicle, which rolled several times into the median. Plaintiff and his mother both suffered various severe injuries, resulting in multiple surgeries and future complications. Plaintiff made pre-trial demand of $1 million. Defense refused to make offer and after two hours of deliberation, the jury found for the defense. Represented a national transportation corporation and its driver in a personal injury matter involving a controlled intersection. Plaintiff, a Buckeye city police officer, alleged that while responding to a call requesting police assistance, in a fully marked patrol car, the Defendant, operating a tractor-trailer, failed to stop for a stop sign, causing the Plaintiff’s cruiser to become entangled in the Defendant’s truck. Defendants admitted negligence, but argued damages. Plaintiff alleged that in addition to several severe head and facial injuries, he is unable to perform his occupational duties and will have difficulty maintaining steady employment due to his cognitive and emotional impairments. Plaintiff made a pretrial demand of $5 million. During closing arguments, Plaintiff’s counsel asked jury to award Plaintiff more than $10 million. Defense offered and suggested $2 million, based on expert testimony. After a 6-day trial, the jury deliberated for more than four hour, and awarded Plaintiff an amount commensurate to the Defense’s suggestion, just below $3 million. Obtained unanimous jury verdict in favor of defense in a wrongful death matter. The Decedent, an unemployed male, who was traveling on I-10 as a dust storm caused zero visibility to occur, was traveling at 45-miles per hour and rear-ended the vehicle in front of him. The Decedent’s father, who was driving immediately behind his son, was operating a tractor without a trailer, travelling between 45- to 55-miles per hour, when he rear-ended his son (the Decedent’s) vehicle. Our client, a full-service expedited carrier, and its driver, the Defendant, was driving behind the father and collided into the Decedent’s father after the father rear-ended his son. The Decedent’s family brought suit for his wrongful death, alleging that the Defendant’s driver negligently rear-ended Decedent’s father’s vehicle, propelling it into the Decedent’s vehicle, causing Decedent’s fatal injury. The Defense denied liability and, with expert testimony, argued that the Decedent suffered his fatal injury when he was rear-ended by his father. Plaintiffs made pretrial demand on $1 million. The Defense offered $100,000 and after a 5-day trial, the jury returned a unanimous defense verdict. Represented a world-wide transportation and logistics company in a wrongful death incident on I-10. As the Decedent was traveling on I-10 after 8 p.m., her vehicle developed a flat tire and came to a stop in the number three travel lane. The Decedent’s family brought suit against our client, claiming that because the Defendant, a truck driver operating a loaded tractor-trailer, failed to recognize the hazard created by the Decedent’s vehicle and take appropriate evasive action, the Defendant negligently rear-ended Decedent’s vehicle. Denying liability, the Defense argued that the Decedent created a sudden emergency and the Defendant acted reasonably. Additionally, the Decedent was negligent when she stopped her vehicle in a travel lane and failed to engage her hazard lights. The Defense also argued that the Decedent’s husband was negligent in the maintenance of his wife’s vehicle, as he placed an inappropriate snow tire, which had a bulge, on the vehicle. Plaintiffs made pretrial demand of $10 million and during trial, suggested the jury award $25 million. The Defense offered $2 million. After a 4-day trial, the jury deliberated for more than three hours and returned a verdict in favor of the defense. Phil frequently presents on a variety of issues affecting the transportation industry and in the areas of professional liability and product liability.